Rev. 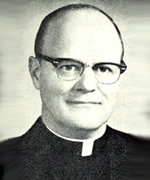 James L. Naughtin, CSV, 63, chaplain of St. John’s Hospital Springfield, Illinois formerly of the Kankakee area, died at 1:05 p.m. Friday, June 4, 1976 at St. John’s Hospital. He was in the 43rd year of his religious life and the 35th year of his priesthood. He was, born March 14, 1913, in Ohio, Illinois, to Mr. and Mrs. Jas Naughtin. He entered the Community of the Clerics of St. Viator in 1932 and was ordained May 22, 1941. Father Naughtin was named assistant pastor of St. Patrick’s Church in Kankakee, Illinois in 1941, where he served until being appointed pastor of the Holy Family Church, Athens, Illinois in 1942. 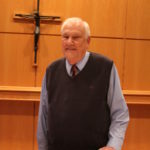 He was named assistant pastor of St. Viator Church, Chicago, Illinois in 1951 and pastor of St. Joseph’s Church Springfield, Illinois in 1954. He was named pastor of St. Anne Church, St. Anne, in 1960 and became chaplain of the English Speaking Chaplaincy in Bogota, Colombia, in 1969. He was appointed chaplain of St. John’s Hospital, Springfield, Illinois in 1971. The wake service was held at Staab Funeral Home, 1109 South 5th Street, Springfield, Illinois on Sunday, June 6, 1976 at 8 p.m. The funeral was celebrated at St. Joseph Parish, 1318 North 5th Street, Springfield, Illinois on Monday, June 7, 1976 at 11 a.m. Please remember Father Naughtin in your Masses and prayers.